Light pollution is a worldwide phenomenon that is often overlooked, especially in a housing society and other similar structures. In short, light pollution is misused or misdirected light. When outdoor lights in a housing society are improperly installed, the light problem of light pollution might surface due to obtrusive light. Some steps need to be taken in order to prevent light pollution in a housing society. This problem can be easily resolved as long as the residents are informed and briefed about the same. Switch on the lights only when necessary. In housing societies, corridor and other outdoor lights are switched on even after daybreak. People responsible for handling such outdoor lights should be strictly instructed to switch off lights when not required. The same can be applied to residents also. People should switch on the lights only when necessary so that light pollution is reduced. Most housing societies have more outdoor lights than required. In this case, a closer speculation is needed and all additional lighting devices should be removed. Do not go for high wattage lights when the work can be done using low wattage lights too. Use high wattage lights only when it is necessary. The maintenance team can run a check on all the unnecessary high wattage lights and uninstall these. Housing societies should only use full cutoff fixtures for lighting appliances. These fixtures help the light shine towards the ground and prevent light from shooting out in tangents, causing light pollution. Installing motion sensors can help the housing society management control light pollution. These motion sensors automatically switch on the lights when there is activity in the specific spot. This way, electricity charges are reduced and housing society members will be easily able to afford the cost of installing motion sensors. Reflectors should be installed. Reflectors are lights which help outline a path, for example, like the driveway of a housing society. Housing society roads need have a network of lights to light up a path. These are easier to run and are not affected by power outages. They are considerably cheaper also. Housing societies should try and use lights which diminish glare when the light is aimed downwards. The housing society management should spread awareness among the residents of the society about light pollution. This will help all residents learn about the cause and support the same. Simple steps to prevent light pollution can even be inculcated in kids through interactive sessions on weekends. An informal session conducted can also help adults work for this environmental cause. The housing society management can ideally hold a resident meeting, where the exact timelines for switching on the outdoor lights and switching them off can be defined. Also, the lights that are used to illuminate the outdoors need not be flashy or high powered. Light pollution can be prevented if the management, housing society residents and the maintenance team work together and put in some effort. ApnaComplex is India’s #1 mobile and web based Apartment Management Software. An idea that is becoming increasingly popular among housing society members is creating and maintaining a community garden. Many city based communities are now turning to community gardens to become self-sufficient and also to deal with ecological issues by adding a tinge of green to the surroundings. If you happen to live in a housing society that has a large space for gardens, your task will be easier. You can take up the lead and work towards creating a thriving space of greenery along with your neighbors and other residents. First, make sure that the available space is not allocated for other purposes. Once you get that cleared and discuss your plan with the other residents, you can get down to business. Get together a band of people who share your enthusiasm for gardening and farming. Hold a meeting that outlines the benefits of a garden within your housing society that can be more than just pleasing to the eye. You can grow vegetables and fruits in your garden if need be. If you have just a small patch of land at hand, decide on what you can grow in it. You can choose from among growing vegetables, one or two fruit trees and some beautiful flowering plants. If you have a large plot of land, you can divide it into a vegetable patch, a fruit trees section, an herb garden and a flower garden. Form a group or association for your community garden and enlist interested members. Draft a set of rules and by-laws for the group. Make it clear at the outset that each member will have to contribute towards the garden in terms of money, work and in other ways if you aim to make it a success. Remember that in any community activity, it is good to have a legal agreement in place to avoid future complications. You can have a legal agreement drawn up listing the rules and regulations of membership. Include also a limitation of liability draft that will list what situations will be covered by the community and what will not be covered. Take out community insurance if possible. Decide how you are going to raise funds for your garden, for it will certainly involve some expense in terms of buying seeds, equipment etc. Decide if you are going to collect membership fees to make sure everyone contributes or whether the association should do the same. You can also hold fund-raising activities like cook-offs and yard sales to collect money. Divide the work among the members. Find out who is willing to be in charge of administration activities, fund-raising activities and who is willing to get down and dirty, doing the actual work in the garden. Among those who are willing to do the garden work, divide the responsibility on the basis of looking after certain types of plants or, if you have a big enough plot, responsibility for small parts of the overall land. Take care while creating the proper infrastructure for your garden. Irrigation facilities, garden/farm equipment, seeds, fertilizers, manure, and pest control options need to be finalized. If you have access to natural fertilizers and manure, go in for an organic garden that does not use any chemicals. This will be an added incentive to the community, to raise food uncontaminated by chemical fertilizers and other pollutants. Use waste products from the garden and kitchen waste to make your own fertilizers. Plan the community garden for all seasons. Grow fruits and vegetables during the summer and monsoon seasons. During the winter months, grow plants that will re-fertilize the soil. Make your own compost heaps and manure to replace the nutrients in the soil that have been lost in the last growth cycle. Plan your community garden and maintain it well and you will have an oasis in the middle of the city that not only provides a pleasant patch of green for the eye to feast on, but can provide your housing society with many food items that are naturally grown in your own community, by members of your own housing society. Setting up a house can be a complicated task or way easier than you expect it to be. The major factors that should be taken into consideration before setting up a house are the amount of space you have and the capital that is needed to materialize it. Space is an important aspect when you are trying to set up your house. Figure out the number of rooms you have and what do you plan to fill it with. Ideally a house should have a living room, a well equipped kitchen, a bathroom, bedroom, patio or a balcony, cleaning supplies and a general room or an empty space. The living room should have a set of chairs, a couch or futons; a coffee table can be set up in the centre of the room, and a TV can be placed at the corner with a well distributed stereo system so that the sound emanates from every corner of the room and a DVD or VCR player. The kitchen area should be well organized and clean. You can have a dining table along with matching chairs. It is necessary to have a storage container where you can stuff all your dishes, glasses and cups. In order to cook a good meal and cook it fast, you need to have the necessary amenities and appliances in your kitchen such as a coffee maker, microwave, a good set of silverware, baking pans and sheets, silverware trays, knives, cutting boards, freezer baggies, paper towels, hand towels and a refrigerator. The bathroom is a place that needs to be well maintained, sanitized and cleaned regularly. There must be a level of safety precautions while setting up your bathroom such as using the shower or bath mat so that you do not slip when the floor is wet. Other necessary items needed in the bathroom are soaps and shampoos, soaps, a toothbrush holder, towels, plunger, toilet paper and a soap dish. An air freshener is a must in the bathroom to keep bad odor and dampness out. Your bedroom should have an aura of calmness and serenity around it. The accessories in your bedroom need to be perfect to provide the right ambience to you. The bed should be of the right height and size so that you can comfortably sleep in it. The bed spreads and the pillow covers should match, a night stand along with a single table and chair will help you sit and work at night, a dressing table, a rug, an air conditioner or fan, a lamp and an alarm clock. You can also place your computer in your bedroom so that it is convenient to work on. You have to be careful while putting down your money while purchasing these items. It wouldn’t be wise to spend too much on most of the items as you have better versions coming out in the market within regular intervals. Electronic appliances always have better versions coming up every now and then in the market; hence, remember to choose and spend wisely. You should be able to gauge your requirements from all the items that you purchase. Announcing a new tool under the Smart Facility Management Tool-set available in ApnaComplex – Asset Maintenance Calendar. In ApnaComplex you could always attach a maintenance schedule to assets and asset groups. In addition to the recent feature of Automate Facility Maintenance Procedures in ApnaComplex, ApnaComplex now supports a ca lander view of the entire asset maintenance schedule. 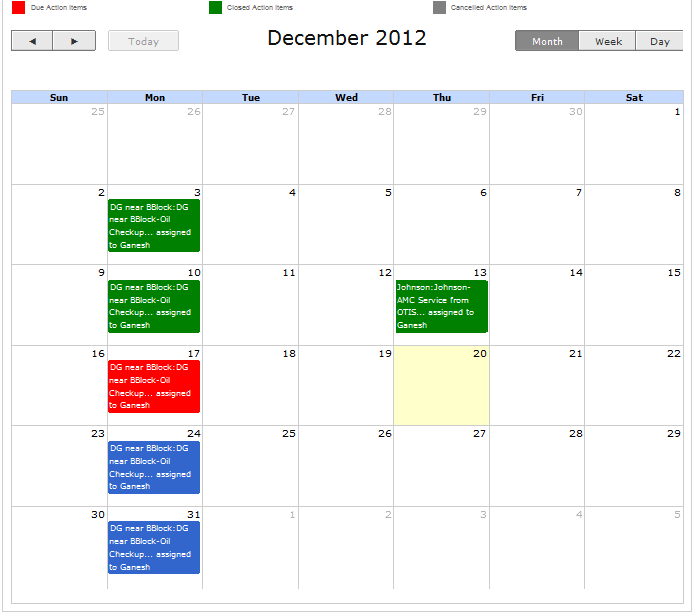 The calendar can be viewed at individual asset level, asset group level or for all assets with color-coded entries for activities that are overdue. Go to Directory->Assets to see the new calendar for all assets and asset groups! Click on the ‘View Maintenance Schedule’ in the asset list and asset group list for specific activities. We have released a new tool as a part of Society Management Tool-set – ‘Ownership History’. Resale of flats is a very common transaction in most housing societies and there is a need to track such re-sale or ownership change as it impacts the association member list. Quite a few societies charge the new owners a ‘Transfer Fees’. ApnaComplex, the leading Apartment Management Software now has a new module just to track ownership changes. All along, ApnaComplex was able to track changes to resident data through the ‘Member Directory’ module. The new module exclusively focuses on Ownership Changes and to maintain the history of ownership of a given flat / villa. Administrator can now add/delete/update Ownership Records to each flat. When adding a new Ownership Record, admin will have to enter the various new information like owner name, purchase / registration date and other information necessary to create the record. Any past dated or future dated records can be added as well. The system automatically considers the record with latest purchase date as the current owner. All records with past dates will continue to be there in the system and can looked up at any time. Like with all other bulk upload features in ApnaComplex, Administrators can import data into the portal using an excel sheet (template provided) here as well! Makes life easy, doesn’t it? Members will not be able to see these records and exclusive access is provided only to Administrators. With the already existing features of Tenant Lease Management and ability to associate multiple documents to every flat / unit, the ownership tracking nicely fits into the society data management tool-set. Head to Reports->Registers->Ownership Details to get started! Happy to release an enhanced look and feel for the Portal Settings page! 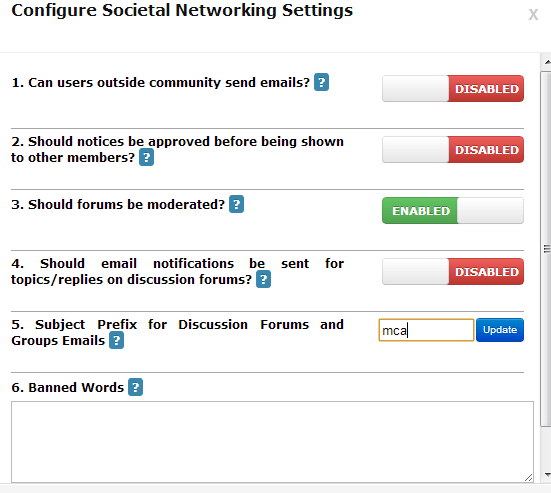 In order to manage the ever increasing number of aspects you can configure in your Society’s portal, we now bring you an enhanced Settings page. This is one of oft used page by our administrators and ‘least’ designed till date. Not any more! From a long, boring question paper sort of look – we moved to a modularized, sleek interface with inline help for all the options. We have tried to make it look more professional and appealing. After logging into ApnaComplex, go to Complex->Settings to experience this. Change is the only constant and we believe in changing for better. How do you find the new User Interface? We are happy to release a major enhancement to our unique offering of Staff Attendance Tracking integrated with Bio-metric finger print readers. All along our attendance reports were “day based” where the attendance calculations were based on a calander day. Due to this administrators had to manually adjust the attendance records of staff who worked in night shifts. In a Housing Society, the security and maintenance staff rarely stick to a ‘pre-defined’ schedule of shifts and the staff keeps randomly chaging over making it very difficult for staff supervisors to identify records that need to be changed for night shifts. Staff Administrators can easily track the attendance of the staff working in Night Shifts where the IN time and OUT time are across different dates with out any manual changes to the attendance data. It is common for staff to work continuous shifts and take a day off when shift changeover happens. With this enhancement the reporting automatically takes into consideration and gives the ‘Total working hours’ in a given date range. For any manual inserts or updation of a attendance record, the attendance tracking tool smartly converts the rest of the records of that user with appropriate IN/OUT. Any consecutive INs/OUTs are highlighted for the admin to rectify. Visit Directory->Maintenance Staff->Attendance Summary to see the new reports and new calculations. You can also see the link the old report, should you have a need. Check cleanliness of the corridors daily, Verify diesel levels once in three days, Send RO Water for testing once every week, Take count of fire equipment assets every month – these are few of hunderds of standard procedures that every society has to keep doing for ever! In ApnaComplex, you now have an mechanism to automate all these through the Enhanced Action Item Tracker – one of the tools offered under our Smart Facility Management Toolset. The committee members can setup all can such procedures in the system with required frequency and all the estate manager has to do is to keep updating and closing these tasks. Email Reminders will be sent on all action items that are due every day so that no task is left unattended. 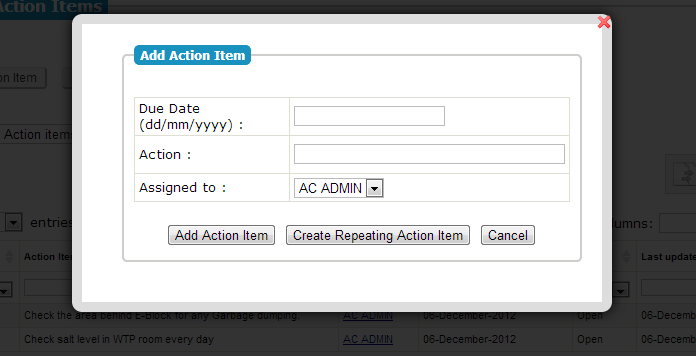 Admins can now create repeating action items for a given date range. Action Items can created with daily, weekly or monthly frequencies. The new recurring action items can be attached to Assets so that the maintenance schedules can be recorded easily. This shall replace the already existing ability of attaching maintenance schedules. Now, users can selected multiple action items and re-assign them to another staff/member, update a new expected closure date or even close/cancel action items. Mighty useful when a new committee joins or when an estate manager changes – simply select all and reassign! You can now easily see Action Items that are due today, that are due this week with the new filters offered – makes it easy to focus on whats needed. This a guest post from Mr. Satish of dbs Legal Solutions in Bangalore. Once you decide to buy your dream house or any commercial property, there are many documents you need to look into thoroughly before closing the deal. If you ignore this, you may be in for an enduring trouble. People in the real estate business narrate many such stories from their vast experience. However, they also add that after the technological improvements brought about by successive governments in the registration process (the encumbrance certificate will have the photographs and thumb impressions of the sellers and the buyers each time the property changes hands), such experiences are on the ebb. Yet, some gullible persons could fall prey to the machinations of others, they point out. If you are the kind of person who hates to encounter unsavoury incidents and loves to lead a peaceful life, the advice from experts is to verify or scrutinise documents in the initial stages itself. It is always advisable that property buyers must insist on seeing the original documents of the house before making the advance payment. It is prudent on your part to make a huge advance payment only when you are satisfied with the authenticity of the documents. Once you make a hefty payment while signing the sale agreement and later encounter problems, you and your family may feel insecure till you get back the amount. Eventually, he will return your money. Suppose, if he returns that money in instalments, then your plans of buying another property will go awry. Hence, ensure that all the documents are in order. One of my client narrates the experience of his friend who had made a hefty advance payment while signing the sale agreement. He says his friend, who had full trust in his real estate agent, paid Rs.5 lakh as advance amount to a person who claimed to be the rightful owner of a property. “The person came in a swanky car along with the agent and said that he is the owner of the property. My clients friend believed them and made the payment. After a few days, when my clients friend insisted on registering the property, both started acting smart. First, the agent said the person is not in station. Later, on one pretext or the other, both kept on postponing the process. Finally, my clients friend had to lodge a police complaint. The police had to trace the two persons and then recover the amount,” he explains. His advice: always approach the rightful owner of the property. One of my client, a real estate agent, has an interesting story. A person who had two wives built two houses in different localities. Before his death, he had taken care to register the houses in their names separately. However, the documents of both the houses remained with the first wife. After his death, the second wife’s children tried to sell the house but in vain. They obtained a copy of the document by claiming that the original was lost. Even then, when they attempted to dispose of the property, they could not do so as the first wife’s children always came in the way. The contention of the second wife’s children was that they had a share in the property. “Many buyers rejected the offer as they perceived it to be an insecure investment,” he says. He says that he takes extra care while dealing with an inherited property. He ensures that all the members of the family are present while signing the agreement and at the time of registration. “A lot can happen between the time of signing the sale agreement and actual registration,” . Some peeved family members may not turn up at the time of registration or create a scene for a higher share, says that in his eagerness to help an aged person, he lost a few thousand rupees. “The person had bought the property in 1967. He wanted to sell the property and told me to look for a buyer. He said that due to some personal problems he had not paid the property tax for a couple of years. He told me to pay the tax so that I can take it back once the property is sold. On the day of registration, another person showed up claiming that the property belongs to him too. The deal fell through. Later, the old man returned the customer’s money but I could not recover my money,” he said that in one deal, he had to obtain the signature of 17 persons. “Among them four were in the U.S.,” he chuckles. All of them say that if anyone has an iota of doubt on the documents they are dealing with, they should release an advertisement in a newspaper. It should be stated in it that they are interested in buying a particular property and if any other person had a claim on the property he/she should bring it to the notice of the advertiser. Pay advance only after seeing the original documents. Have them scrutinised by an advocate. Always ensure that you are dealing with the right owner. Have all the members of family of the owner present during registration. Have a peace of mind to enjoy your property. The improving infrastructure, the leading IT hub and the commercial advancements in Bangalore have made it witness a real boost in the real estate sector. The strategic location and the developing road map have seen a clear rise in the demand of purchase, selling and reselling of properties time and again. This adds to the complexity of the matter as you have to doubly ensure that you are not investing your lifetime savings into a fraudulent property. To prevent yourself from getting duped you can always take the help of a professionally qualified solicitor to get all your legal paperwork verified. For this reason, if you are planning to buy a property in Bangalore then refer to the below mentioned checklist, which should definitely come handy so that you can acquire a clear title. The paperwork required for authentication of the title varies from property to property and the region it falls in. The checklist needs to be verified before purchasing any property. Do not forget that the original documents of title like sale deed, partition deed, gift deed and will etc., are to be verified on a mandatory basis. As the real estate market in Bangalore has become all the more dynamic due to the purchase, sale and resale of flats/apartments, it becomes all the more crucial for the buyer to handle the entire procedure very carefully. If you aspire to own a flat or an apartment in Bangalore and wondering where to start from then have a look at the following checklist and the information you must possess from the developer/promoter before you seal the purchase. Mother deed/ Sale deed: This is the most important document for tracing the ownership of the land. It gives details of the property as to how it was acquired at the initial stage and the subsequent series of transactions it has undergone. You should also check for the original sale agreement showing the builder/developer duly registered. Khata certificate & up-to-date tax paid receipts: In case of a joint venture, the Khata should be in the landowner’s name. If you purchase the property directly from the developer the Khata should be in the name of the developer/promoter. Joint Development Agreement: The agreement should be examined thoroughly if it’s a joint development. You must clearly understand the ratio at which the build-up area is divided between the promoter and the landowner. Encumbrance Certificate: A latest Encumbrance certificate having the details of last 30 years should be checked. It can be obtained from the sub registrar. Approved Plan: Check for a copy of the approved building plan by the respective government authority and also for the portion of the apartment being purchased. Sanction Plan: Verify whether the building plan of the apartment is sanctioned and also check the validity of the sanction plan. You must also check the commencement certificate and take a confirmation from the Municipal authorities if the building adheres to the norms of the laws. NOCs: You should obtain NOCs under the provisions of Income-Tax Act and Urban Land Ceiling and Regulation Act if required. Occupancy certificate: This is issued to the developer by the apartment corporation/BDA/CMC. A buyer should insist for this. Besides the above steps to be followed you should also ensure that the developer has obtained approvals from the Municipal Corporation, Electricity Boards, Area Development Authorities and Water Supply and Sewage Boards. It is advisable for the apartment owners to file a joint declaration under Karnataka Apartment Ownership Act, 1972, get duly registered and attain the rights and legal safeguards. Purchasing a flat in Bangalore for commercial purpose also includes more or less the same steps as in the case of a residential flat like deeds for absolute sale and conveyance. These offer a record for absolute and exclusive property rights of the commercial flat, confirms the usage rights, amenities and infrastructure. Karnataka Ownership Flats (Regulations of the Promotion of Construction, Sale, Management and Transfer) Act, 1962 governs all the matters related to both residential and commercial flats. If you intend to purchase any agricultural land in Bangalore for non agricultural purpose then you must have the approval as per the provisions and rules under Karnataka Land Reforms Act (1961) and the Karnataka Land Revenue Act of 1964. The regulating authority for approving any layouts on the outskirts on Bangalore rests with the Bangalore Metropolitan Regional development Authority or BMRDA. Mother deed/ Sale deed: This is the most important document for tracing the ownership of the land. It gives details of the property as to how it was acquired at the initial stage and the subsequent series of transactions it has undergone. Search Report: It provides details of the original property holder, property history, charges on the property, current property status (all dues paid or still pending) and the number of times the property has changed hands before being owned by the present seller. Your advocate will fetch you all these details and confirm whether it is a legitimate property for sale or not. Agreement: Once the property is decided, make an advance payment and get a written agreement on a stamp paper duly signed by both the owner and the buyer in the presence of two witnesses. An agreement must state: the advance paid, actual price, duration of actual sale, and legal actions to be taken in case of a default from either party. Stamp Duty: This should be paid in full and on a timely basis. To get an agreement stamped it should be without any signature or date and the agreement can be implemented only when the Stamp Office fixes stamps on it. Registration: Get the deed registration done in a sub registrar office within the timeframe mentioned in the agreement. For registering a property you need: house tax/property receipts, original title deed, and previous deeds etc., two witnesses are also required at the time of registration. Apart from the above measures to be followed you should also get hold of an Akarbandi, an Encumberance certificate, Saguvali chit, Conversion order, Payment Challan, Up-to-date Tax-paid receipts, Land Acquisition Status, Mutation Extracts, NIL Tenancy Certificate/ Form No. 7 Endorsement, Podi Extracts, RTC (Record of Rights)/ Phani, Section 79A & B endorsement U/KLR Act, 1961, Patta Book, and Tippani. You should also have the family tree of the vendor, the comprehensive development plan or CDP and a Zonal recognition map to aid you. Another important thing to be remembered is that the property should not be located in the Green Belt Area. Purchase of Converted Revenue Lands requires the following documents- Conversion Order from the Deputy Commissioner, receipt for the paid conversion amount, RTCs for last 30 years issued by the village accountant, documents of ownership, Mutation Register Extracts, Akarbandi/Tippani/Podi Extracts, Tax paid receipts, boundary map, village map, Nil tenancy certificate, approved layout plan, Khata certificate issued by Revenue authority, Encumbrance certificate, Zonal regulation map, power of attorney (if any) and an evidence from the respective authority that no acquisition proceedings exist. The various documents necessary for purchasing a BDA property are- allotment letter, receipts of payment for the site, possession certificate, absolute sale deed, khata certificate from BDA, khata certificate (to be obtained from Bangalore Mahanagar Palika if the property falls under the corporation revenue jurisdiction), up-to-date income tax paid receipts, tax paid receipts from Bangalore Mahanagar Palika, Encumbrance certificate (from allotment till possession date) and a re-allotment letter or re-conveyance deed in case the property is re-conveyed by the BDA. It is highly suggested that acquiring a property through Power of Attorney should be avoided to prevent any litigation in the future. Documentation is the major step in the acquisition of an immovable property of any kind so utmost care should be taken while carrying out all the paperwork. All the agreements should be stamped according to Karnataka Stamp Act, 1957 following all the rules therein. Below are the presentations from the Waste Management and Awareness Sessions” held on Nov 24th 2012 by ApnaComplex. Bookmark – Waste Management in Apartments for all these resources and more! Want to manage your Apartment Complex or Housing Society in a Better Way? Get on to ApnaComplex – Today! ApnaComplex is India’s best web based housing society software. ApnaComplex is designed to make the life of residents and owners lot better by bringing in more transparency and accountability in managing a housing society. Check out why we say ApnaComplex is Best Apartment Management Software and sign up your society today to get the benefits! We even offer ApnaComplex – Free Edition with awesome capabilities which you can use free of cost forever.